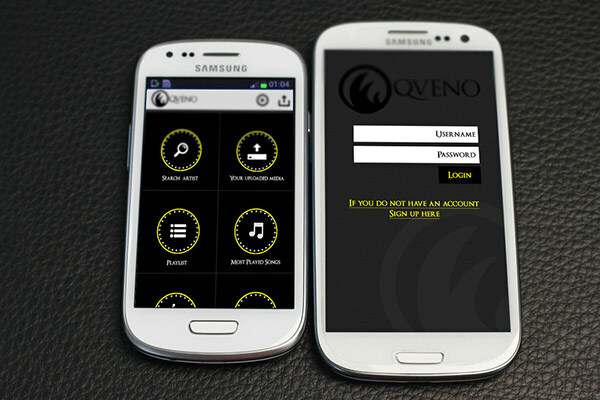 Qveno is a interactive music player for handheld devices. The application runs well on android and on all mobile phones but Spotty on tablets. I still have to develop the iOS version. It runs on Google cloud platform(s) so you know it runs well and FAST. When All versions are complete I will launch it and sign it under my Corporation called Core,Inc. Using the Samsung Galaxy S II and III to show screen compactability. Qveno is a interactive music player for handheld devices. The application runs well on android and on all mobile phones but Spotty on tablets. I still have to develop the iOS version. It runs on Google cloud platform(s) so you know it runs well and FAST. When All versions are complete I will launch it and sign it under my Corporation.